TODAY is our wedding anniversary. How those six years flew past. It's quite overwhelming to look back at what we have achieved together. We both said in our vows that we can't wait to build our empire and now it's slowly growing. So, given the special occasion, we thought we would share a beautiful dish ideal for a date night with your special someone. METHOD: Preheat the oven to 160 degrees. In a casserole dish, heat the oil over medium to high heat on the stove. Season the lamb with salt and pepper and then place in the casserole dish to cook over moderately high heat until browned, about 4 minutes per side. Transfer to a bowl. Add the onion to the casserole dish and cook until softened (about 7 minutes). Next, add the garlic and ginger and cook for a further 2 minutes. Add the crushed tomatoes, followed by the red wine and boil for 3 minutes. Add chicken stock, cloves, cardamom, coriander, cumin and cinnamon and bring back to a boil. Add the lamb shanks and any juices from the plate. Put lid on and place in the oven to braise for 2 hours, turning once, until the meat is very tender. Transfer the lamb to a bowl and cover with foil. Strain the braising liquid into a large pot and skim off any fat. Boil the sauce over high heat until reduced to 2 cups - about 20 minutes - then season with salt and pepper. Add the lamb to the pot again, cover and simmer over low heat until heated through for about 3 minutes. Now for the pilaf. In a frypan over medium heat add some oil, then add onions and sauté for about a minute. Add the capsicum and mushroom. Stir and cook on low heat for 3 minutes. Transfer to a bowl for later. In a blender, add all the ingredients for the spice paste and using some water, blend into a smooth paste. In a large pot, add the spice paste, the other chopped tomato and salt. Cook for 2 minutes. Add presoaked rice into the pan - stir for a minute. Add 2 cups of water. Cook on high heat until the water begins to boil. Cover and cook on medium heat for 10-12 minutes or until all the water is absorbed. Remove from heat and fluff with a fork. Add the cooked onion and capsicum mix and stir through. Herbed yogurt: in a mini processor add the mint and 2 tbs of the yogurt. Blitz to form a paste, then stir this through the remaining yogurt. 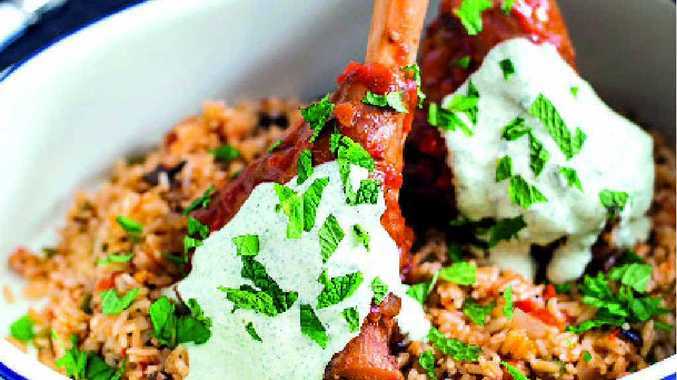 To assemble, serve this dish with a generous amount of pilaf, 1 or 2 shanks on top, spooning over some sauce on to the shanks and then minted yogurt on the side. Serves 4.